Our company has more than 20 years experience leading tours around Northern Thailand. We take small private groups, which means you can go at your own pace, staying longer at the places you enjoy the most. We teach you about Thai culture and traditional lifestyles and everything you see on the trip. For an idea of what's available, check out our itineraries according to number of days, or by destination. Below, we have listed our most popular trips, so you can see what many people choose to do, when they come to Northern Thailand. Day 1 Start the tour from Chiang Mai at 7.30am. Drive north of Chiang Mai for approx. 1 hr and stop at the local market. Take a tour of the market with your guide pointing out all the local produce and stock up on any snacks you may want to buy. From the market head in the direction of Pai stopping at some hotsprings on the way. Stop for lunch in the small town of Pai, then carry on to visit some hilltribe villages in the afternoon. Spend the night at one of the pleasant resorts in Mae Hong Son. Day 2 In the morning visit the ethnic morning market frequented by the hilltribe and local population of Mae Hong Son. Visit the Padong (long neck tribe) village, including a 1hr elephant ride into the village. 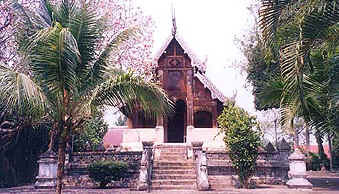 Then back to Mae Hong Son and visit some of the Shan style temples including Wat Doi Kong Mu. Take a late afternoon flight back to Chiang Mai. Highlights - elephant riding, hilltribe visits, the Padong tribe, Shan style temples and touring some of the most beautiful areas of Northern Thailand. This tour starts at 8.30am. You are picked up from your hotel by your guide. Drive north of Chiang Mai to Chiang Dao (approx. 1hr) to the elephant camp. At the elephant camp you will see the elephants taking their morning bath and demonstrating some of their skills. Afterwards take an elephant ride for approx. 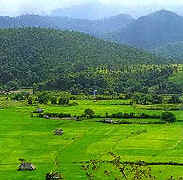 1½ hrs to a Lisu hilltribe village. The ride takes you through some of the lovely forest scenery and along the river. After lunch take a bamboo raft trip down the river for approx. 1 hr, admire the scenery and absorb the tranquility as you float down the river. Then drive back to Chiang Mai in the afternoon. Highlights - elephant riding and rafting, in a beautiful location in Northern Thailand. Day 1 Drive from Chiang Mai up to Chiang Dao (approx. 1 hr.) and stop at the elephant camp. Take a ride and admire the view from your seat on the elephant's back, for approx. 1hr. Then explore some hilltribe villages and learn about the cultural variety of the area. Two of the tribes you will see are the Palong and the Lisu, two of the most colourful and interesting tribes. Then drive on to Taton and after lunch take a longtail boat from Taton to Chiang Rai. You will be able to see the scenery and life along the river banks. The boat journey lasts for approx 3 hrs. We finish the journey in Chiang Rai, which is where we spend the night. Highlights - elephant riding, hilltribe visits, scenic boat trip, as well as touring the famous destinations of upper Northern Thailand - Mae Sai and Chiang Saen. Tour Planner - Choose a tour according to number of days or destinations. Rafting Tours in the rivers around Chiang Mai - both whitewater and bamboo rafting. Private classes and half day or evening classes available. Copyright © 1998-2006 Wayfarers Travel All rights reserved.